Mural on Finland Building in South End. Photo courtesy of Timothy McCool. 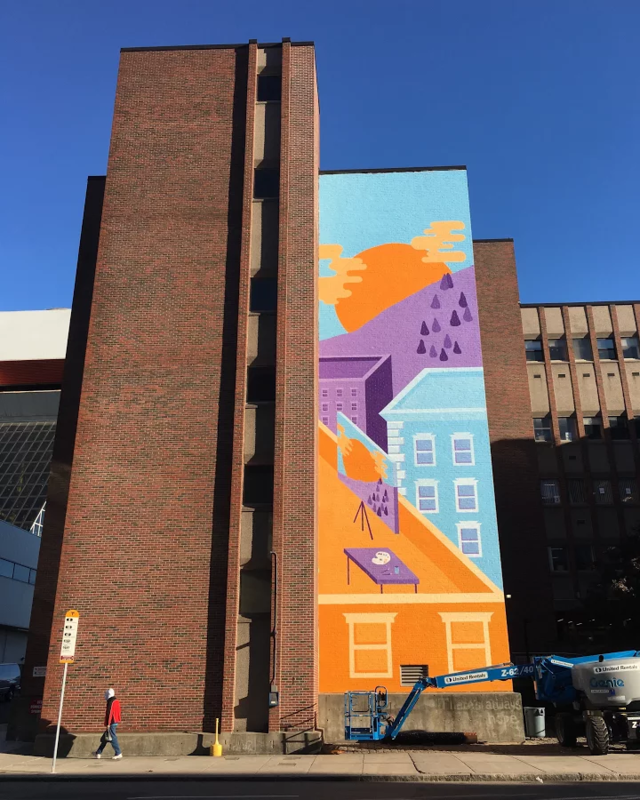 BOSTON - Tuesday, October 17, 2017 - Mayor Martin J. Walsh, the Mayor's Office of Recovery Services, the Mayor's Office of Arts and Culture, the Boston Public Health Commission (BPHC) and Boston University today announced the completion of a mural on the Finland Building at 774 Albany Street in Boston. "The Finland Building mural is an excellent depiction of the strength and resilience of the surrounding community," said Mayor Walsh. "I hope this will serve as a reminder to those struggling with addiction that each day brings new opportunities and that the City of Boston is here to support them every step of the way." The mural, which primarily consists of bright blue, orange and purple, is a depiction of several city rooftops and a sunrise, with a painting of that same scene on one of the rooftops. According to artist Timothy McCool, the easel and paintbrushes are evidence of someone being inspired by the sunrise and wanting to capture it on a canvas. "I chose the design and colors of my mural to be bright and hopeful," said artist Timothy McCool. "Making art is a way to describe the indescribable and to express feelings that are hard to express with just words. So it's my hope that it can brighten their day even just a little bit by providing some sunshine in their life." McCool is a South End resident who has made several contributions to Boston's public art landscape. Last October, he assisted in the creation of the Spaces of Hope mural, which can be seen from the Rose F. Kennedy Greenway. The mural was one of several initiatives championed by the City during September, which marked Recovery Month, a national effort that aims to combat the social stigma around addictions, celebrate recovery and promote awareness of recovery services. The Finland building houses several recovery service programs operated by the Boston Public Health Commission (BPHC) that offer detox and other treatment programs, as well as harm reduction services. This artwork serves as a form of encouragement and support for those taking advantages of the services offered inside the building. Boston University partnered with the City of Boston and the Boston Public Health Commission last year to improve the neighborhoods around the Melnea Cass Boulevard and Massachusetts Avenue intersection, which is home to their medical school's campus. The City of Boston released a call for artists in April 2017, as part of a broader effort to improve the neighborhood around the intersection of Melnea Cass Boulevard and Massachusetts Avenue. In the span of only a few square miles, there are several opioid treatment clinics, two of the largest emergency shelters in the region, a detox facility, a long-term residential treatment program, a resource and referral center that places scores of individuals in treatment every day, a peer recovery center, the biggest harm reduction site in New England, and a world-class health-care organization whose mission it is to serve Boston's most vulnerable residents. The mural is one of several ongoing efforts to beautify this part of the City where people in recovery go to receive services. Since last year, four outreach workers have been walking main roads and side streets in the area seven days a week, engaging with individuals and helping them access the services they might need. Most recently, the Mayor increased resources for the Mobile Sharps Team, doubling the number of workers available to locate used syringes and properly dispose of them. "This is one of our many efforts to pair recovery with art, which is a critical form of catharsis for so many recovering from addiction," said Jen Tracey, Director of the Mayor's Office of Recovery Services. "By using the City's infrastructure and buildings as a canvas, we hope to raise awareness, combat stigma, and promote the collective resilience of individuals in recovery." "At the Boston Public Health Commission, we are proud to serve all Boston residents," said BPHC Executive Director Monica Valdes Lupi, JD, MPH. "This building is the entry point into recovery for so many, and we want this physical entrance to reflect the welcoming nature of our staff and programs." The mural is also an embodiment of Boston Creates, the city's ten year cultural plan for improving and expanding the arts and culture industry in Boston. "A key vision of the Boston Creates Cultural Plan is to create a City that uses art as a means to foster creative thinking and solve problems," said Julie Burros, Chief of the Mayor's Office of Arts and Culture. "It's great to see this mural play a role in the conversation about tackling the issue of addiction in Boston."